Yesterday’s paper had a front-page story concerning a filing by Jason Chamber’s office with the Attorney General for Open Meeting Act violations. He has been waiting 17 months for a determination. The story claims his office can only prosecute violations for 18 months. Welcome to our world Jason! The request filed by Judy Stearns took 2 1/12 years. Prosecute? Has anybody every been prosecuted? Long time readers learned long ago that one set of rules applies to government, a completely different set for the peons paying their bills. Laws are immaterial to government officials because criminal prosecutions are so rare they consider being found guilty of violations meaningless. The AG writes a letter (often years later) slapping their fingers and it’s over. 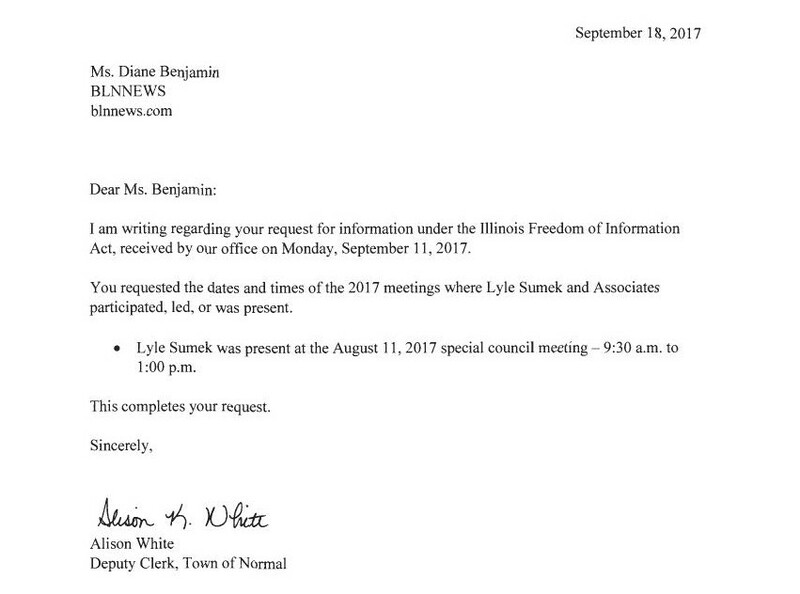 I filed this Request for Review on September 18, 2017. I haven’t heard from the Attorney General yet (no surprise) if they are going to investigate. It does prove why recent items before the Normal Town Council have passed with no discussion. The meeting is almost totally an Executive Session. The Normal Town Council plotted against citizens for 2 1/2 hours behind closed doors. Why did the Town of Normal vote to get rid of employees? Think they might be in trouble financially? They are! There was no discussion because they had already discussed it at their “planning session”. What else is the Town of Normal hiding? Since they don’t have any money, they applied for another Tiger Grant to build an underpass. They spent over a Million Dollars with a consultant – just to apply for the grant. These clowns have no problem spending other people’s money! They had a grant for an overpass, but that wasn’t good enough. They want to add to the Uptown Taj Mahal. Next they will want their names on a plaque commemorating their theft of other people’s money! Jason Chambers CAN prosecute Open Meetings Act violations! When is he going to start? An AG opinion isn’t required to prosecute. Why was that story in the paper at all? Posted in BloNo, Bloomington, Koos, Liberal Media, Local, Pantagraph, Progressives, Renner, Taxes.Tagged Attorney General, executive session, Jason Chambers, Normal Town Council, Open Meetings Act violation, Planning session, Public Access, Tiger grant. Previous Post What is up with State Farm?